The hardest part of the Sattvik diet was the snacking or rather the lack of it. It also made me realise that all my snacks come out of a box or a package. Again, this was the husband’s contribution to healthy snacking and in keeping with the rules for last week. There’s no need to feel guilty even if you do reach for seconds. If you are familiar with ‘bhel’ think of this as crisp and spicy bhel but without all the fried bits added to it. 1. In a large pan, heat the oil. Add mustard seeds. When they splutter, add in the spices and the puffed rice. The trick is to do this quickly and stir so that the spices don’t burn. 2. When all the puffed rice and spices are mixed well, sprinkle the salt. Mix again. 3. Roast on a medium heat, stirring frequently 12-15 minutes until the puffed rice is nice and crispy. 4. A bowl and a spoon is all you need to enjoy this healthy and ‘made from scratch’ snack. 1. Adjust the spices to make it as mild or spicy as you like. 2. To make a heartier version of this snack, add some finely chopped onions, tomatoes and coriander leaves. Add a squeeze of lemon. Heaven in a bowl! 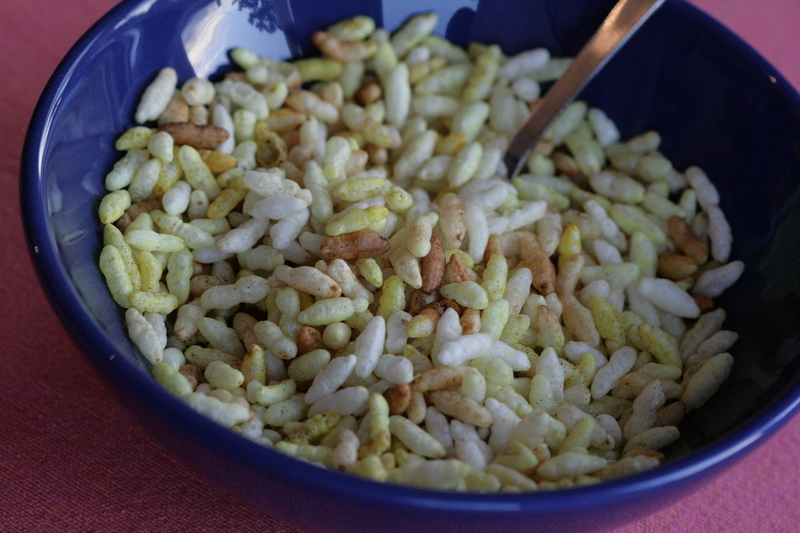 This entry was posted in Teatime snacks or Brunch ideas and tagged bhel, epicurious, Indian snacks, kurmure, moori, murmure, puffed rice, savoury snacks, vegan snacks. Bookmark the permalink. Such a simple and healthy recipe, Don’t we all love these snacks.